You can use any font you like. Titles cannot include text links inside the title. You can however assign a link to the whole title object. Because it creates an image file, a title is best used as a high quality header. Text objects are best used for large blocks of formatted text such as you are reading now. To create a new title, select the Title button on the Tools toolbar at the left or select Title from the Object menu at the top of the page. Double-click the title "Unshaded Title" above. Edit it so that it says "Shaded Title"
Click the Shading tab on the Quick Editor. 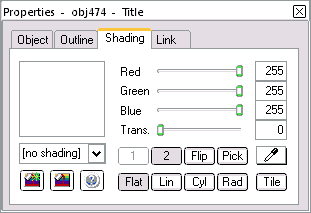 Notice that because the title is black, it has [no shading] showing in the drop-down list of shades in the Quick Editor. To pick an existing shading, open the Shading Editor > Selection tab > and select from the "Current Shading" drop-down list box. Gradient fill for titles is the same as gradient fill for other objects. Select the Quick Editor > Shading tab and try some gradient fills on the title just above. With High Render work window checked, all anti-aliased objects will be displayed with anti-aliasing on your workpage. This will show you the quality of the title when you publish. But it may make the workpage sluggish, especially if you are working with a large project or on a slow computer -- if so, you may wish to leave the High Render box unchecked. Hold the Ctrl Key on your keyboard, then press the Up or Down keyboard arrows. As you do, the title will rotate. Either enter an angle into the Rotate box or use the adjacent Up/Down arrows. Click the rotate and skew tool at the top left of left toolbar. Identify the rotate handles of the title and rotate it by dragging. More on Rotating.  As you rotate the title, it may display significant aliasing at different angles. Check the High Render check box to view the quality of the title when it is published. Titles rotated to 45 degrees will generally produce larger image files than titles that have 0 or 90 degree rotations. If you find one or more of these processes sluggish, uncheck the High Render box in the Quick editor to improve the performance of the workpage. Skew a title in the same way as you would skew an image. This is one-way process -- you can Convert to Path, but you can't go back to a Title. If you don't see the Convert to Path option, you may have already converted that title. Titles can be created using any of the available file formats set as discussed in the image tutorial.